If you managed to get past the round-the-block queues outside of cinemas this weekend to catch a screening of the latest Bond film Skyfall, you will have no doubt seen the forsaken island making a rather impressive appearance as the secret lair of Raoul Silva, the dandy but deadly cyberterrorist played by Javier Bardem. 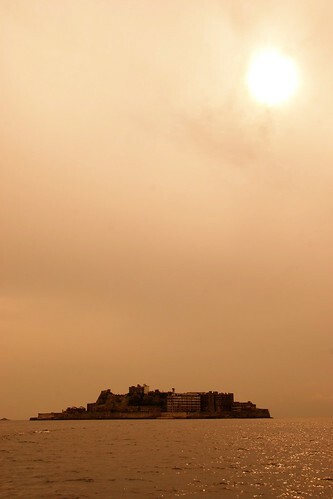 And as we unravel the dark history of the island, Hashima’s sinister new movie role will begin to make perfect sense. In the panoramic shots of Mr. Bond approaching Hashima by boat, it’s clear to see why this great slab of concrete sitting in the middle of the ocean with sinister high-rise buildings sprouting from it has been nick-named “Battleship Island”. 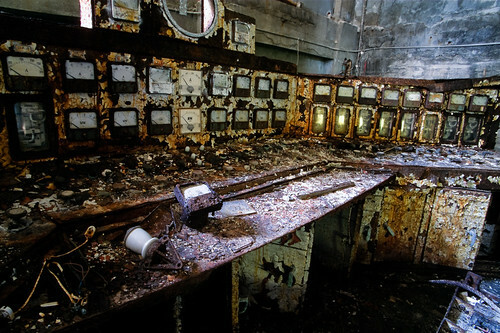 In fact, the island looks so much like a battleship that it was actually torpedoed during World War II by American submarines. 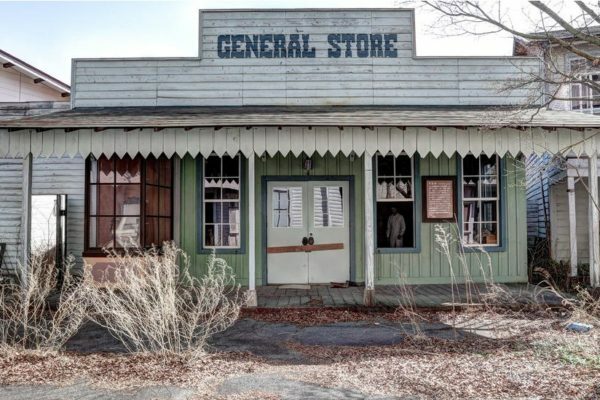 Thirty-eight years after total human desertion, nothing remains but decayed buildings and ghostly memories. 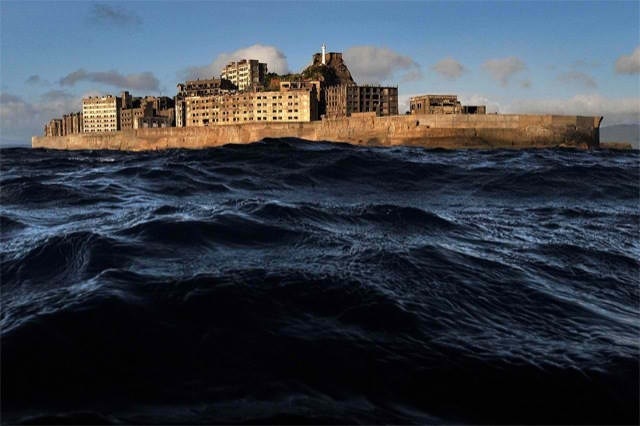 But would you believe that Hashima once held the record for the highest recorded population density on earth? 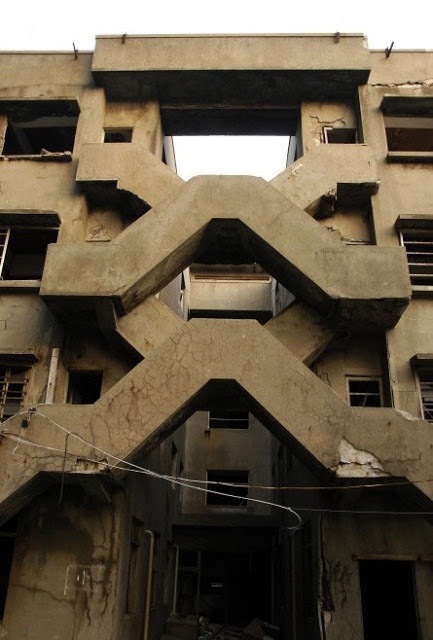 To cater to an expanding population, in 1916 the world’s first reinforced concrete residential building block that would later be the blue-print for housing projects around the world, was built on Hashima Island. So what happened here? Despite what it might look like, this was not a war zone. 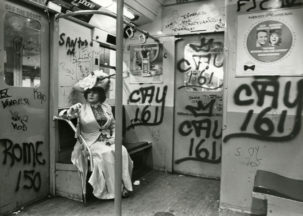 There was no outbreak of disease or biochemical disaster here. 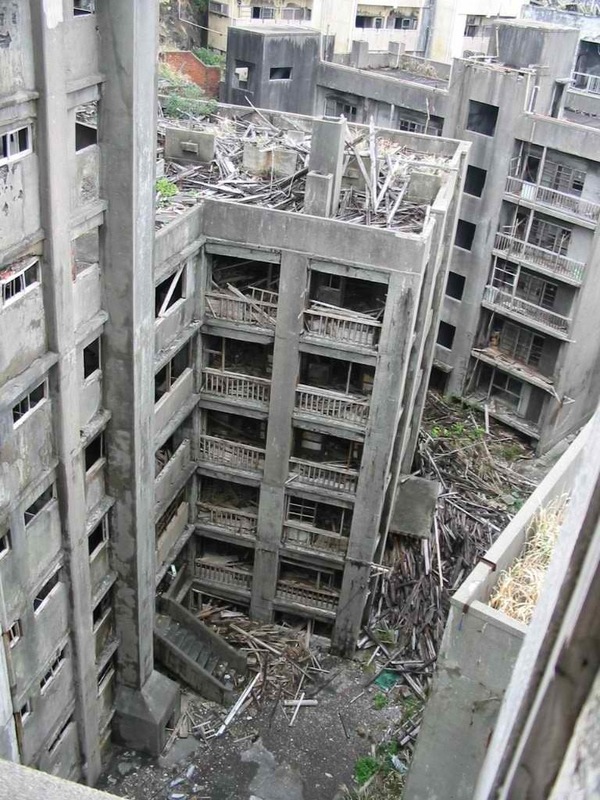 Hashima Island is the victim of a country’s rapid industrialization. 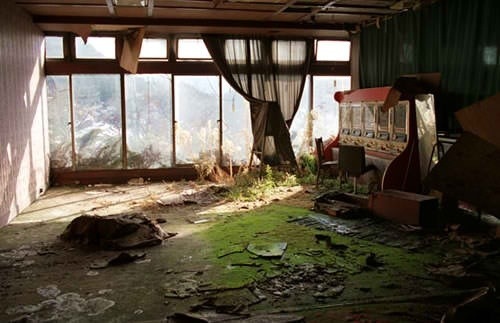 Once a thriving coal-mining town owned by the famous Mitsubishi Corporation, it was home to more than 5,000 employees and their families. From 1887, Japan’s Mitsubishi mined coal from the sea floor under Hashima and at its peak was producing more than 400,000 tons in the early 1940s (around the same time Japan allied with Nazi Germany and after several years at war with China). Although not widely documented, during the war, the Japanese government and Mitsubishi also illegally forced Korean and Chinese prisoners to mine coal 600 meters below sea level between 1943 and 1945. Some 500 Koreans and 200 Chinese were brought over on Mitsubishi-owned boats known as “Hellships” that transported prisoners to their assigned destinations for forced labor. 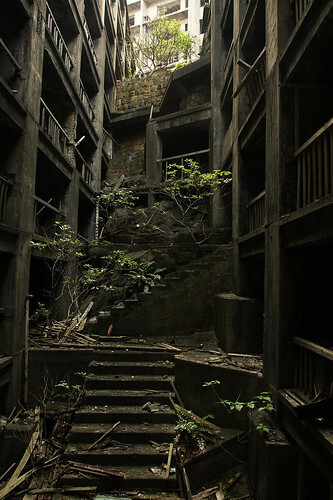 It is believed over one hundred forced laborers at Hashima died on the island. By 1959, the population density on the 480m x 160m island reached 139,100 per square kilometer in the residential district. Hong Kong’s population density was recorded at 6,782 people per square km in 2010, to put it in perspective. 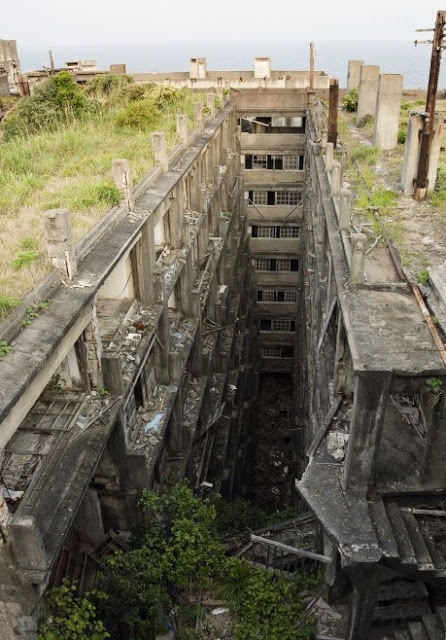 Hashima residents were literally living on top of each other in prison-like conditions. But as the next decade rolled in, Japan began favoring petroleum and Hashima’s once thriving coal production went steadily into decline. After nearly a century, in 1974 Mitsubishi closed the mine. The company only offered new jobs to a small fraction of people, on a first come first served basis. 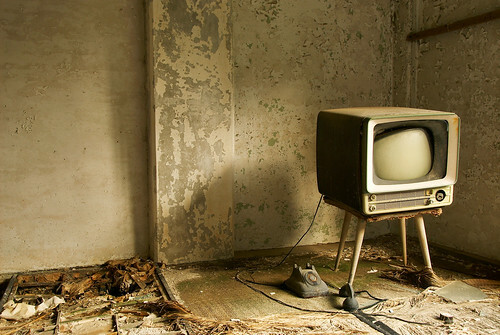 Within weeks, the most densely populated place ever recorded on earth was completely deserted. 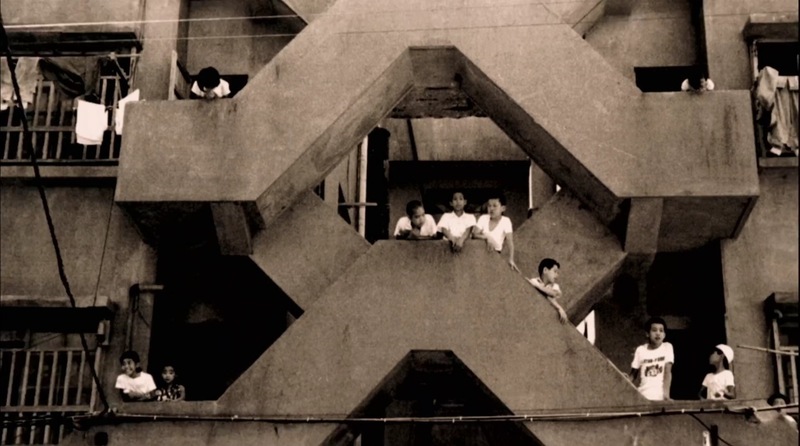 Apartments and courtyards, despite their sinister design, once echoed with the laughter of children playing. 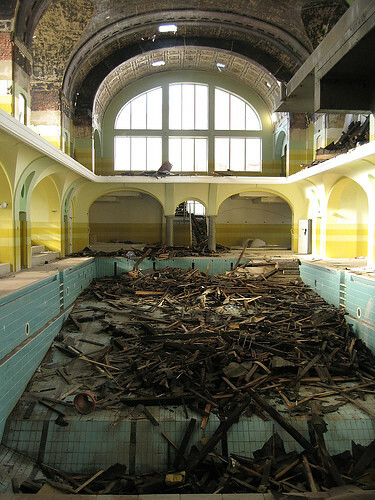 It’s hard to imagine this would ever be a place parents would bring their children. But now only the corroded rusty remnants of their toys and the scrap metal of their school playgrounds remain. 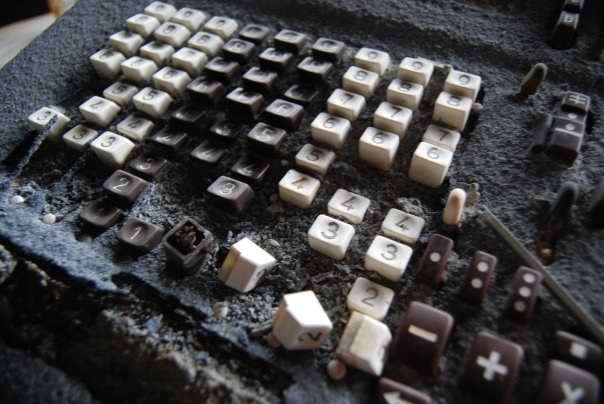 Under nature’s relentless hand, a startling degradation rapidly took hold of Hashima. Today, homes are cracking, sagging and near collapse as wind carries sea water up into the buildings. 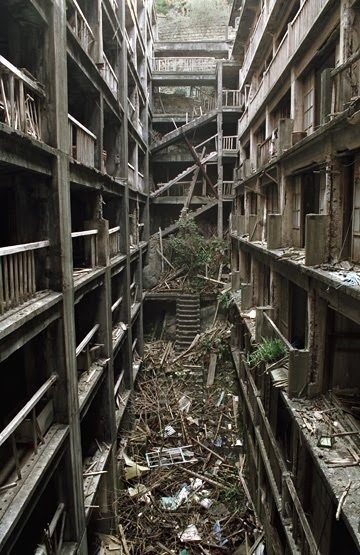 As nature executed its hostile takeover, wooden facades and balconies were quickly destroyed and lumbers and concrete walling fell to the once crowded streets below. The passageways and staircases that connected the hastily-built concrete blocks are now falling apart. “Steps of Hell”: the steep staircase that lead to apartments in the buildings up to 9 stories. 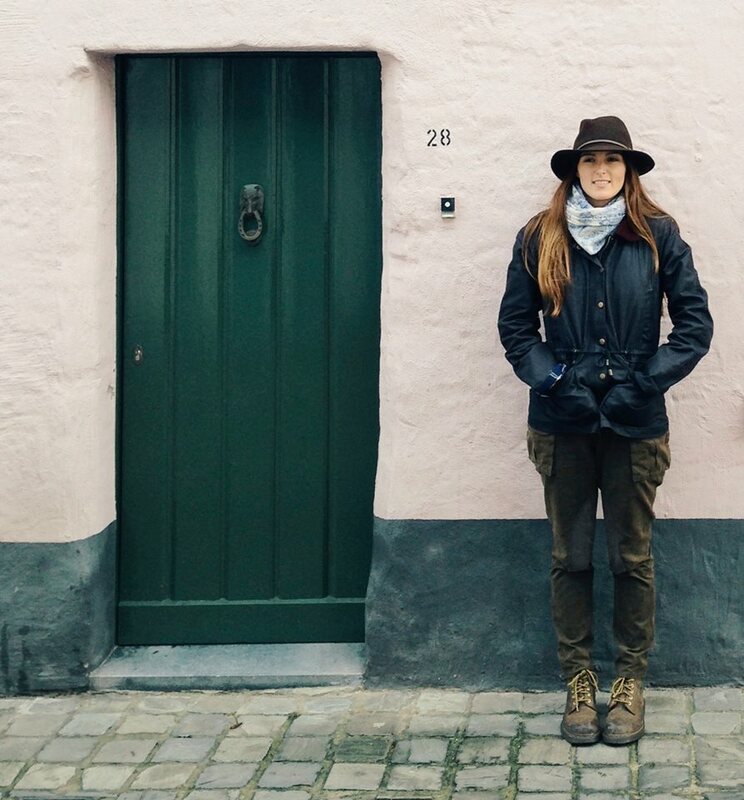 There were no elevators or escalators on the island. For many years, visitation to the island was forbidden, punishable by deportation from Japan. 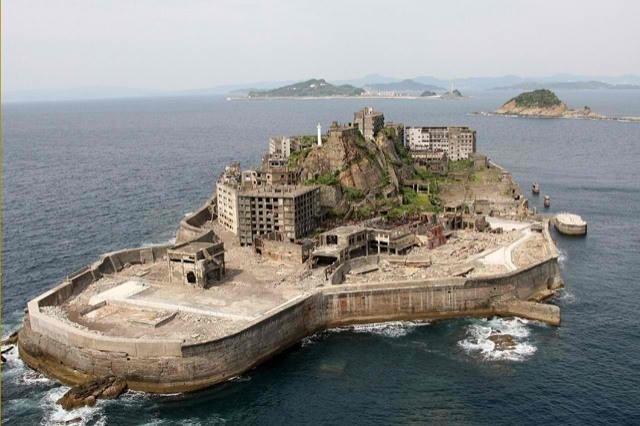 But in 2008, as interest in the mysterious island grew, it was proposed that Hashima be designated as a UNESCO World Heritage site. It has yet to be designated, possibly due to the protests of South Korean authorities, who object on the grounds of the suffering incurred by Korean forced laborers during the war. Remaining survivors today have yet to be compensated by the Japanese government or Mitsubishi. 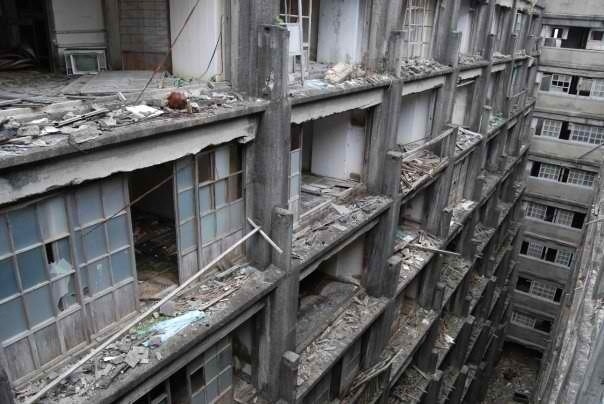 Hashima is essentially a laboratory for showing what happens to man-made reinforced concrete left in a savage environment. Every year during typhoon season, rain and winds of up to 100 miles per hour eat away at the remnants of a community while huge ocean waves smash directly into buildings that stand like tombstones. Just as it began, a bare rock without any vegitation or human presence, Hashima has gone back to lifelessness. In 2002, Swedish film-maker visited the island with Dotokou, a Japanese man who grew up there and wants to see it become a museum. In this video, we see the former resident re-visit his old apartment for the first time, where he finds his mother’s decorations still on the wall and the markings from when they measured his sister’s height on a wooden pillar. Interestingly, we also hear him talk about the countless people that died unnecessarily on the island. A subject he says, he “probably shouldn’t talk about”. Update: Hashima Island is now on Google Streetview!